The Icon Brickell complex is an urban development center in the City of Miami, Florida, United States. 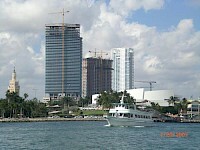 It is located on the south side of the Miami River in Downtown's northern Brickell Financial District. The complex consists of three skyscrapers and the Icon Brickell Plaza, connecting the towers at their base. The first two towers, Icon Brickell North Tower and Icon Brickell South Tower, are twin towers. Each one is 586 feet (179 m) tall with 58 floors. Infinity at Brickell is a skyscraper in the City of Miami, Florida, United States. It is located in Downtown's Brickell Financial District. It is currently the 7th tallest building in Miami and Florida. Although not in the same complex, it is being built across the street from Infinity II, hence its name. The location is in southwestern Brickell, on South Miami Avenue near 13th Street. The building opened in 2008. It is 630 feet (190 m) tall, and has 52 floors. Infinity II will be a skyscraper in the City of Miami, Florida, United States. It will be located in Downtown's southern Brickell Financial District, and will rank in the top ten tallest buildings in Miami. When completed, it will be 736 feet (224 m) tall, and will have 65 floors. The building will contain 21,450 square feet (1,993 m) of Class A office space, and will have 11,568 square feet (1,075 m²) of retail, which will occupy the lower floors of the building. 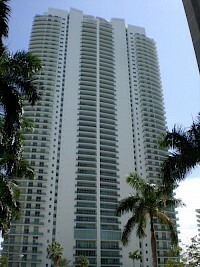 Jade at Brickell Bay is a residential skyscraper in the City of Miami, Florida, United States. It is located in Downtown's Brickell Financial District, directly on Biscayne Bay. The tower, which opened in 2004, is 528 feet (161 m) tall and contains 48 floors. The address is 1331 Brickell Bay Drive. Latitude on the River is a complex of residential and office towers in Downtown Miami, Florida. The complex consists of the 44-story north tower (476 ft / 145 m) Latitude on the River and the 23-story south tower Latitude One (both completed in 2007). The complex is located on the southern banks of the Miami River in downtown. 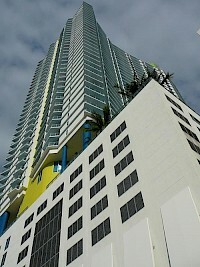 Lima is a high-rise building planned for construction in the Wynwood neighborhood of Miami, Florida. It was approved by the City of Miami on November 16, 2006, and is scheduled to begin construction in late 2007. If completed, the building would rise 473 feet (144 meters), with 41 floors. Lima is one of several new residential developments taking place in Miami, and is a part of the city's recent Manhattanization wave. The architectural firm who designed the building was Kobi Karp Architecture. 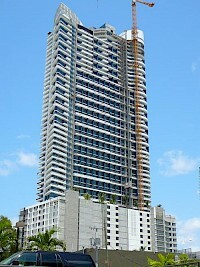 The Lynx Complex will be a complex of skyscrapers in Downtown Miami, Florida, United States. When completed, it will contain five buildings over 600 feet (180 m) and each over 50 stories. 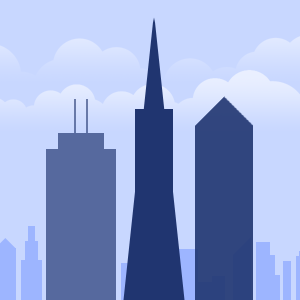 The two tallest buildings in the complex have been approved by the city council and the Federal Aviation Administration, and construction has not yet begun. The tallest building in the complex, the Lynx Central West Tower, will rise 746 feet (227 m) and 76 floors. MarinaBlue, also known as Marina Blue, is a skyscraper in the City of Miami, Florida, United States. It is located in northeastern Downtown, and forms part of the Biscayne Wall, a series of skyscrapers visible from Biscayne Bay along the west side of Biscayne Boulevard. The tower was one of the first buildings making up the wall to be completed. Built by Hyperion Development, the developers of another building named Blue on the Bay further uptown, the building finished construction in May 2007. Marquis is a skyscraper in the City of Miami, Florida, United States. It is located in northeastern Downtown, and forms part of the Biscayne Wall, a series of skyscrapers visible from Biscayne Bay along the west side of Biscayne Boulevard. It was topped out in March 2008. The tower is 700 feet (210 m) tall and contains 67 floors. The building currently stands as the 3rd tallest building in Miami and the state of Florida, behind the Four Seasons Hotel Miami and the Wachovia Financial Center. Max Tower is a proposed high-rise building planned for construction in the downtown region of Miami, Florida. If completed, the building would stand at 508 feet (155 meters), with 55 floors. The tower has an estimated completion date of 2009. Max Tower is a part of the recent Manhattanization wave that is taking place throughout Miami. The tower is currently going through the approval process, and final designs have not yet been released. Maximilian M. Tower a.k.a.